Another new member of my ever-growing herd. 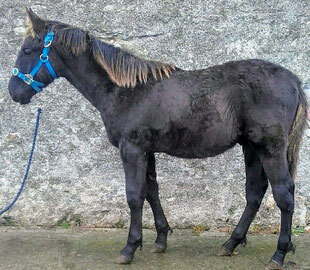 Alice's Emperor, a registered Irish Draught Colt - with exactly the same birthday as Herr Rosenkavalier. He still has a few years of hanging out and growing up to go before I start working with him, but I'm sure those two years will pass faster than you know it! The number of Irish Cobs in my herd is growing all the time. 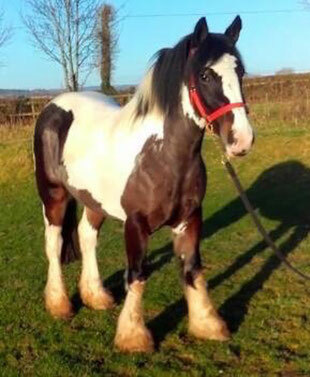 We just welcomed the latest addition - Nemyt, a lovely skewbald mare with two blue eyes. I googled her name and found out that it is actually an elfen name. That suits her really well - our little elf! An extremely interesting weekend - and we learned a lot. Participants from Germany, France and Belgium joined me to learn about the POR section of TREC riding and driving. Now we know (theoretically!) everything we might need to use for the map-reading part of a TREC competition. 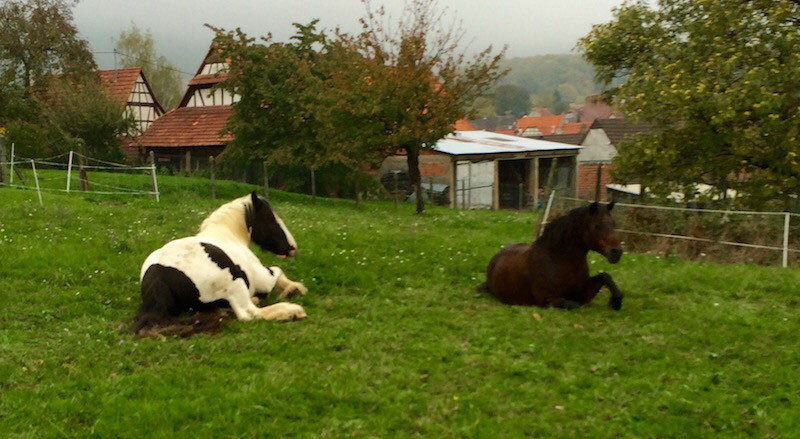 Alsace can even be beautiful without horses, and even on a cold, grey winter's day. This picture is of the colourful roofs in Wissembourg with a view into the vineyards just over the border in Germany. 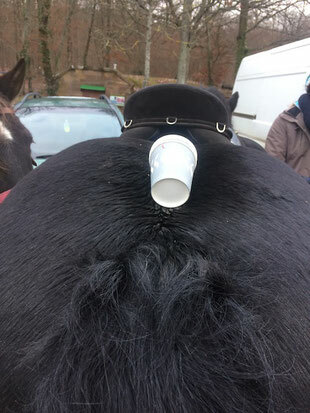 The mulled wine certainly hit the spot in the middle of our ride to the Christmas market in Lampertsloch - but what do you do with your empty cup when your mulled wine is finished? Well we found it - the perfect place for an empty cup! 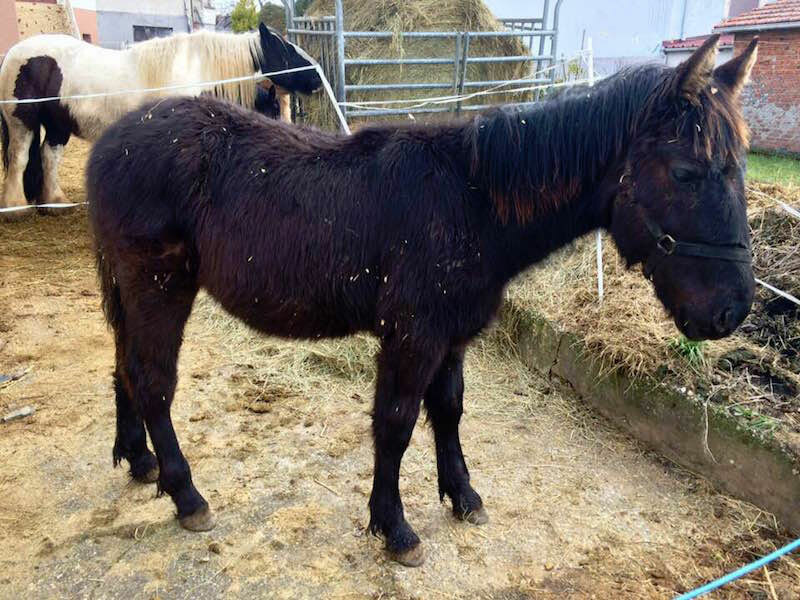 Another new horse. Alice's Emperor, an Irish Draught colt with excellent breeding (nothing but Class 1 stallions in his papers) will be joining us from Ireland at the start of the New Year. 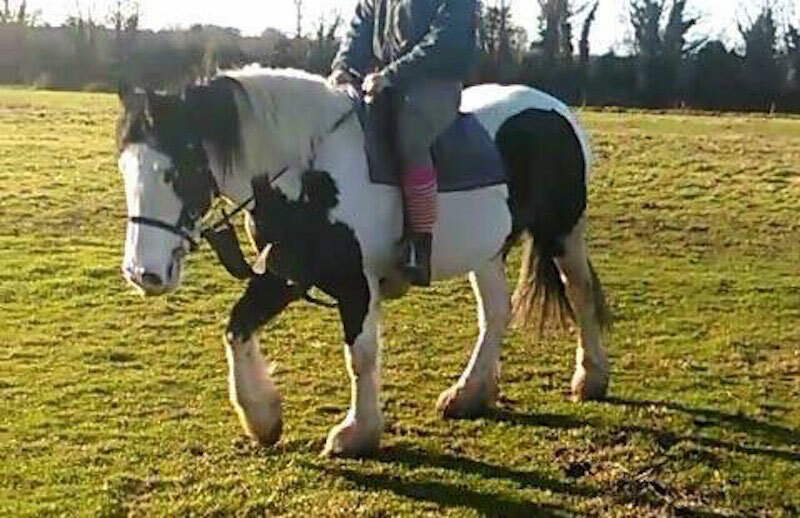 I'm very much looking forward to working with him although it will be a couple of years yet until he comes under the saddle and I start to drive him. Winter is starting to make itself felt here in Alsace. I love riding along snow-covered trails. The whole forest sounds different when everything is dampened by a white blanket of snow - and the countryside looks so different when it is all white. A childhood dream becomes reality. 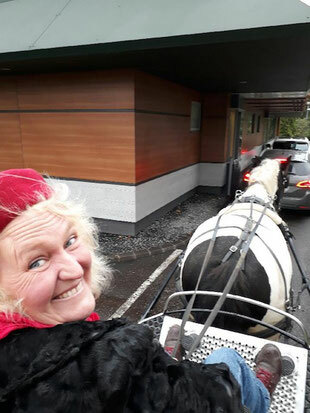 I have now FINALLY taken the carriage through the drive-through at McDonalds. It got some strange looks from some passers by but Paddy was on brilliant form and didn't bat an eyelid. And yes, you ARE allowed to take a carriage through the drive through in France (not like in the UK). The only thing we learned was that the people on the carriage had to stay on the carriage to place their orders, as pedestrians are not allowed to order in the drive-through. What a weekend that was! 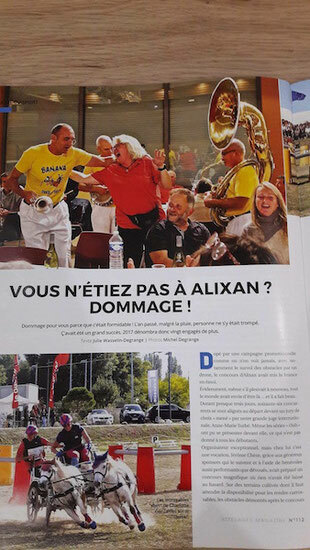 The driving competition in Alixan (Rhône-Alpes) was a blast! We didn't place too badly in the competition - some excellent marathon hazards there to tackle and a decent water hazard (ha yes, we LOVE water!). But the "real" highlight was the party on Saturday evening. We had a blast! 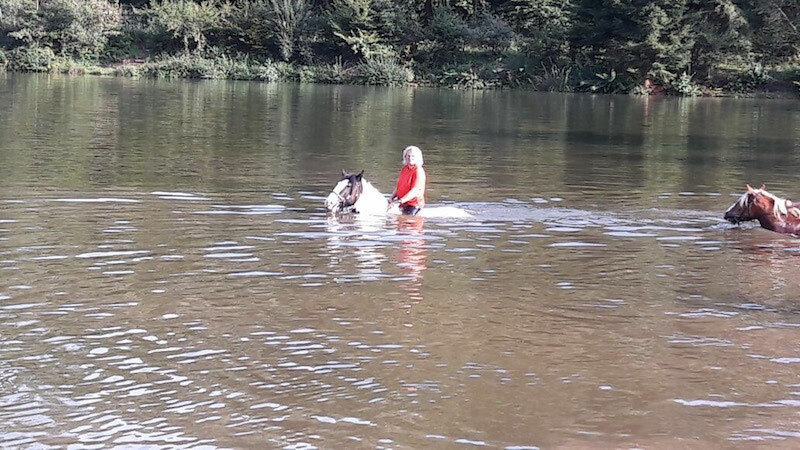 I just love swimming with my horse - and he does too! There's nothing better than going for a dip together on a hot summer's day. 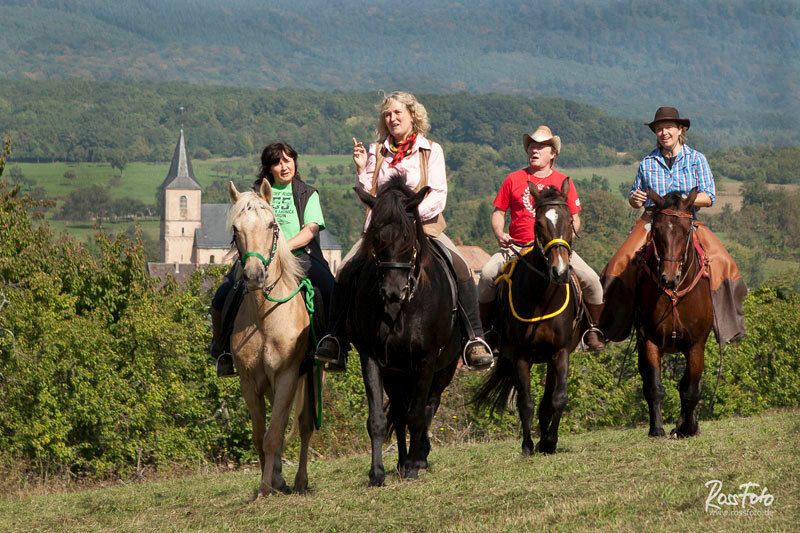 The Hunsrück region is where I used to live in Germany, and this group of riders had a great time enjoying the wonderful scenery that this part of Germany has to offer. So we put in whole lot of work, went to every TREC competition we could find within a reasonable distance of Lampertsloch, and all the hard work paid off. We are now the French Vice-Champions in driven TREC. And as you can see - Paddy has learnt to fly (on his lap of honour after the prize-giving). What an amazing time we had! 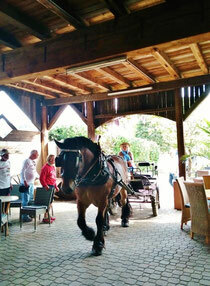 Three days with the carriages in the Ardenne region of Belgium. 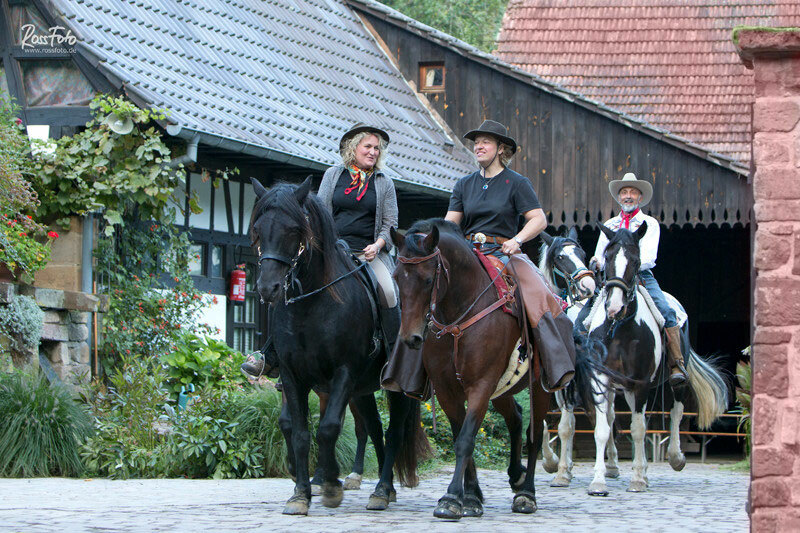 Superb people, lovely views, charming villages, great beer, and the horses were on best form. What more can you want? The Altschlossfelsen in Germany - part of the border trail and the swimming and rocks trail. It looks a bit dramatic, but I can promise you that it's fine - as long as you know where to put your feet! What a great group of horses. Of course my riders were fantastic too. From left to right Paddy, Quasada, Venus, Fizz, Champion, Joules. Another new addition.... We "made" this one ourselves. His name is Herr Rosenkavalier or "Kava" for short. 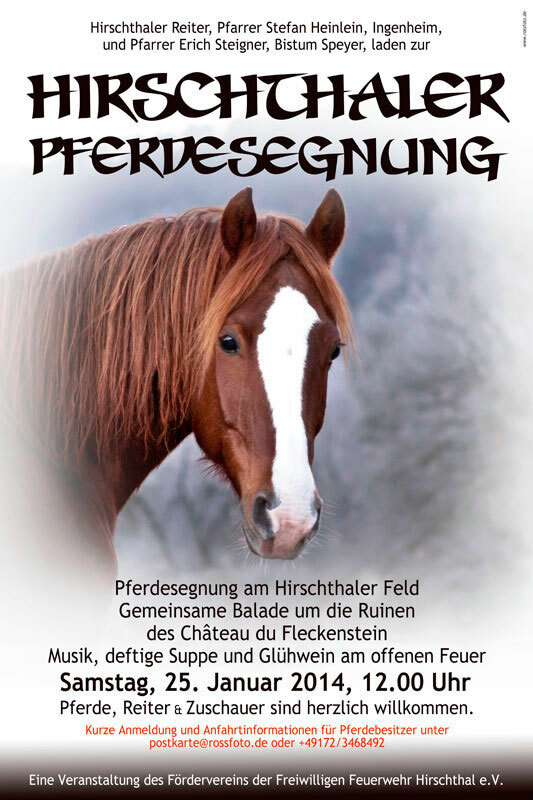 His dam is English Rose, my thoroughbred mare, his sire is Szikla, a wonderful Furioso stallion from the Hunsrück region of Germany. And this is Joules, her little sister. 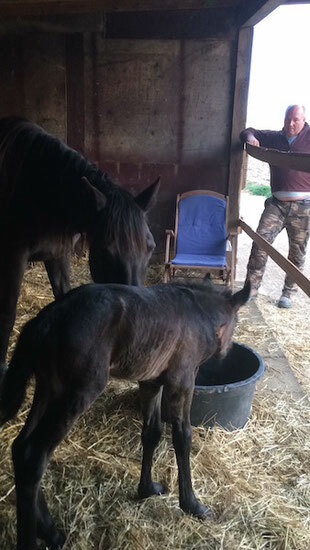 They are both already going really well under the saddle - I can't wait to start driving them! I love it when I go to the field early in the morning and some of the horses are still lying down sleeping. This morning I got to wake up Jacky, my Welsh bay gelding, who got up straight away, and Paddy, my Irish cob. He was still feeling a bit sleepy so I got to cuddle with him a bit first before he got up. Wow! 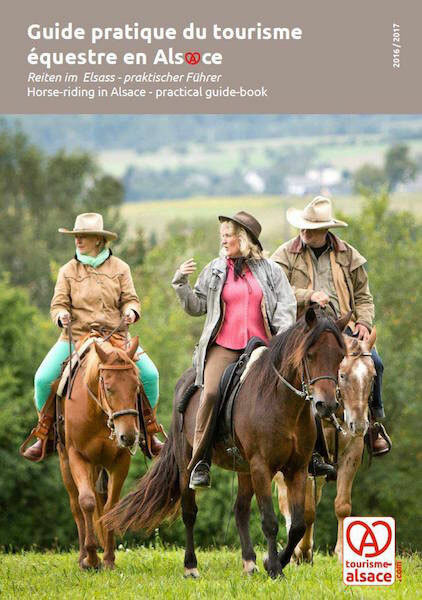 The equestrian tourism association has just issued its new brochure with all of the information anyone could need about riding in Alsace (equestrian B&Bs, trail riding companies, riding schools, farriers, equine dentists...), and Alice en selle is right there on the cover page! Of course my equestrian B&B and trail riding centre are also listed. Here's hoping that the brochure makes it even easier for more riders to enjoy the delights of riding in Alsace in the next few years! ...Sometimes I just sit there and dream of the places I'll ride. And that's just what I did at sunset yesterday evening. 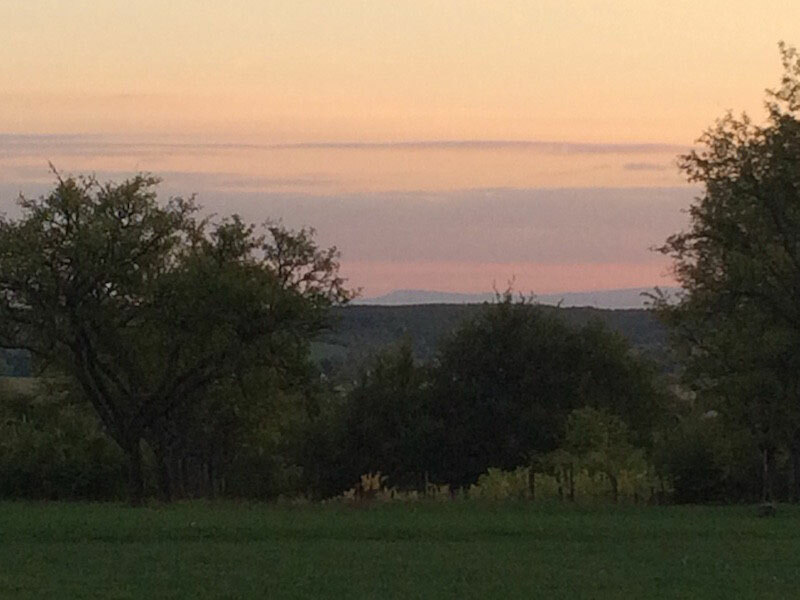 The mountains on the horizon are part of the Central Vosges above Obernai. I'll be there at least three times next year. 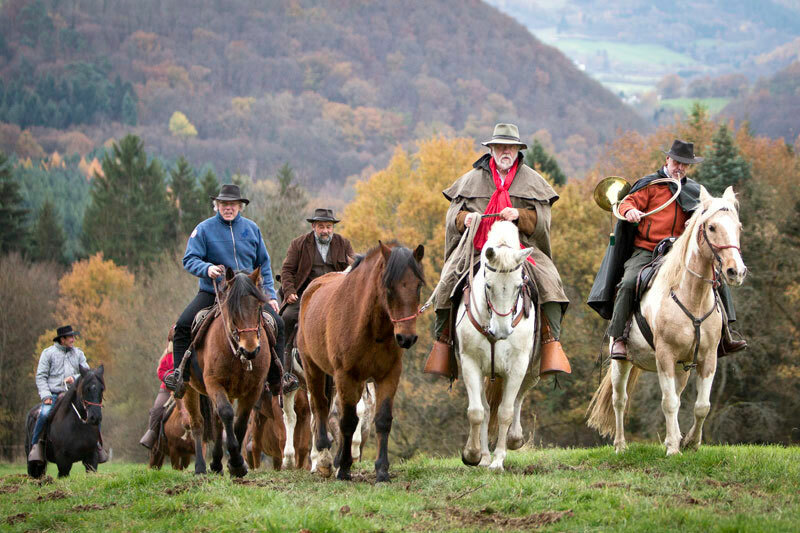 Once with a group of carriage drivers when we drive down the Alsatian "Route des Vins", once with riders in Le Hohwald, and I plan to ride to the Central Vosges next summer too. I'm looking forward to it already. Where does Alsace start and where does Alsace end? 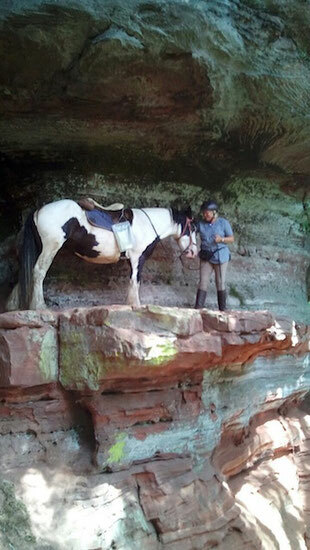 Sometimes that's not important, especially when you're enjoying the wonderful trails in what I sometimes call "Red SandStone Land". To be honest, I can't remember how many times we crossed the French/German border on our ride last week. Sometimes it's clearly marked, as in the picture, sometimes there's just a stone beside the path that shows that you're crossing the border. What a wonderful week that was! At the start of September a group of riders came to me - their plan was to ride down the Vosges mountains from the north to the south. They were looking for a local guide for the first week, and that's where I came in. 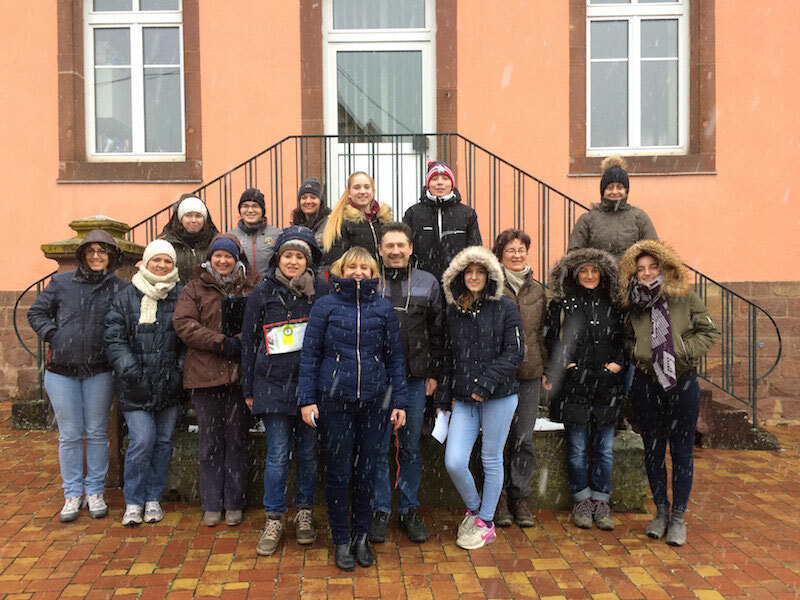 We had a brilliant time on some of the best trails that North Alsace has to offer - and I'm looking forward to seeing them all again next year. How to make a small girl and her horse-loving Mum very happy in three easy steps. 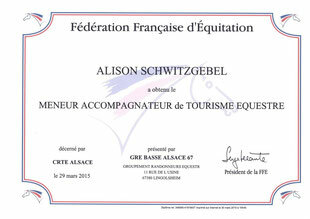 Come to Alsace for a riding holiday with Alice. 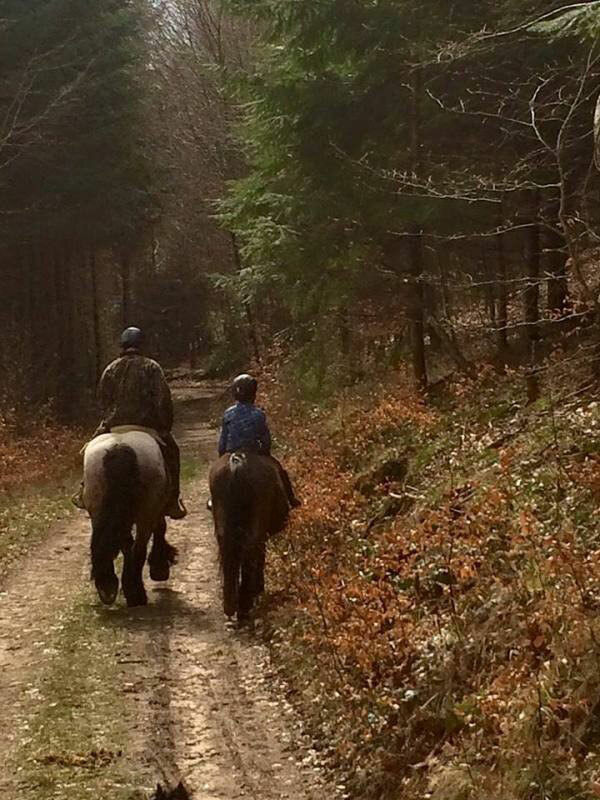 Put Mum and daughter on horses. Go riding. Simple! We had a great time together, and I think that mother and daughter both want to repeat the experience. 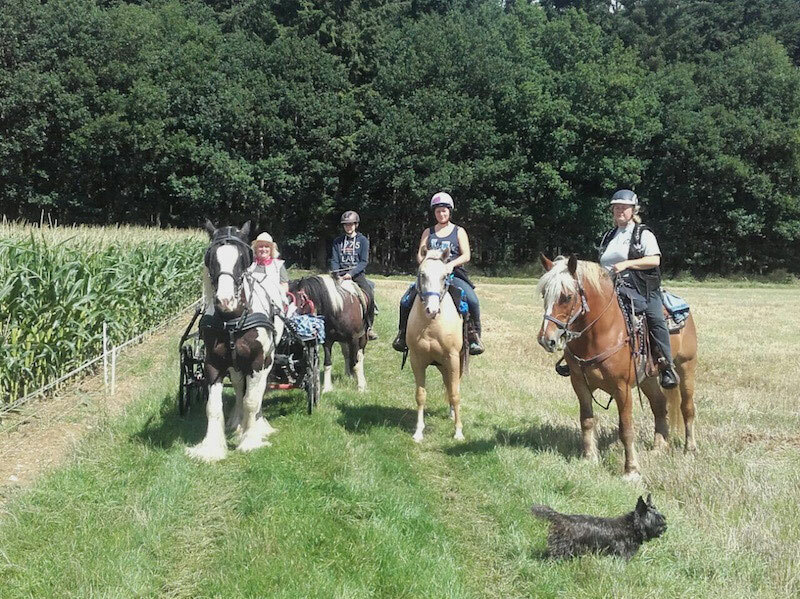 You can tell that summer is drawing to a close.... We set off on Saturday in blazing sunshine - perfect riding weather. As optimistic riders we didn't all remember to take our rain jackets with us. About 15 minutes from home, at the Auberge des 7 Fontaines, it started chucking it down. A quick note of thanks to Phillipe for donating us a couple of bin bags - they kept my riders dry enough until we got back to Lampertsloch! 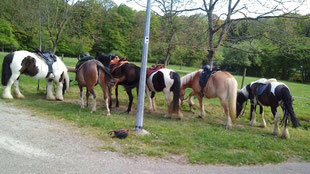 A little word of warning: This weekend at the Gimbelhof, a lovely forest restaurant, I mentioned to this group of riders that the hitching posts aren't particularly solid and that they may be best tying their horses up to the trees (you can see my horses tied to the trees in the background). Luckily none of the horses were hurt when they pulled the bar down, but before tying their horse up anywhere riders should ALWAYS check that it is good and solid and not liable to break! 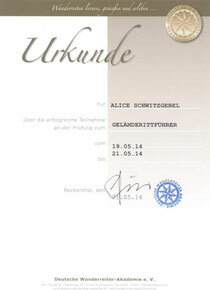 Alice en Selle is always happy to support a good cause. 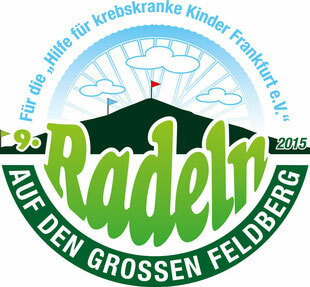 The Frankfurt-based association "Radeln auf den großen Feldberg" (Cycling on the Feldberg) takes place on 6 September this year in support of "Hilfe für krebskranke Kinder Frankfurt e.V." (Aid for children with AIDS in Frankfurt). It all started in the spring of 2007 with a bet. Manuela and Bent wanted to know who was fittest and decided to cycle up the Feldberg. When Bent's wife heard about the bet she suggested that they should really collect some money for charity with the event. These were the humble beginnings of what is now a large event. Donations to date total EUR 87,005.92 and have thus made a major contribution to helping children in Frankfurt suffering from AIDS. We're very pleased to be one of the event's sponsors and are looking forward to playing our part to help this excellent cause. Even the very youngest riders have fun with Alice en Selle! 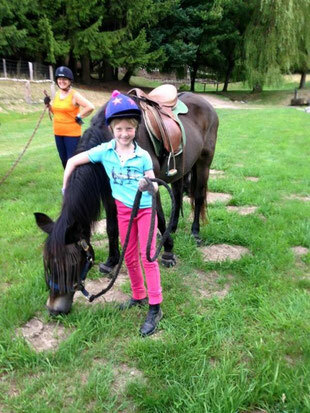 This young rider from Ireland fell in love with Jilly straight away and we spent a wonderful week in the saddle. I would love to welcome you back (and your Mum too, of course!) next year. That was one HOT weekend! 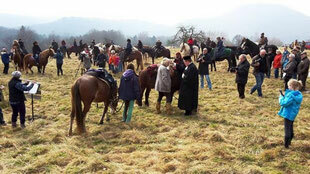 Elmo and I took part in the heavy horse day in Seebach. 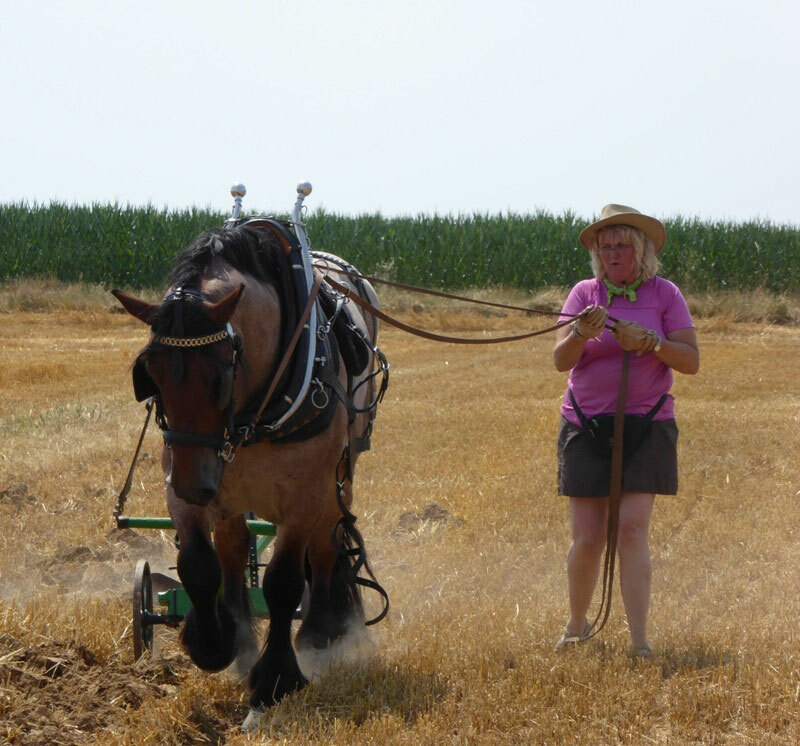 The disciplines included pulling a sledge with an increasing payload to see which horse can pull the most weight, obstacle driving and ploughing. I have to say that as absolute newcomers to ploughing we didn't do too well at that, but we still managed to take 4th place out of ten participants. I guess I'm going to have to find me a plough and a field to practice in so we can do better next year! I used to run regularly with FHHH while living in Frankfurt, and when I was asked if I could accompany the DOM run in Bundenthal with Elmo and the cart I simply couldn't refuse. We had a wonderful time - and it was great to see old faces (and meet some new ones too). Elmo was totally brilliant all weekend. We really enjoyed ourselves. Let's run away together.... That's just what we did in May, when we "escaped" to Le Hohwald for a couple of days. We had one morning with light rain and very low clouds (hence the fog), but after that the sun came out and we had a terrific time. 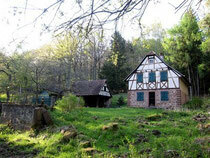 I'm really looking forward to my next trip to Le Hohwald in September. What a brilliant day we spent together! I love it when other riders come to visit me with their own horses. This time Iwan came to visit - a lovely long-legged Shagaya Arab. We managed to hit a lovely sunny day in the middle of a rainy week and headed off through the forest to the north of Lampertsloch. 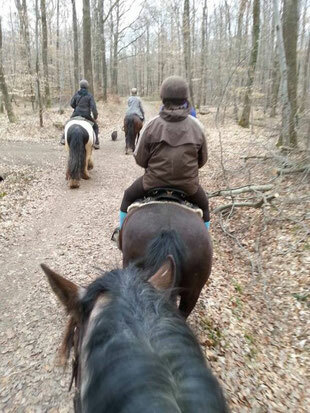 We had a great time walking, trotting and cantering along the trails. I can't wait for you to come back again! We had a lovely trip out at the weekend. A handful of riders in the saddle, and a handful of non-riders on the cart with me. The weather was excellent and we stopped for a picknick at one of my favourite places - the ruined chapel in Climbach. 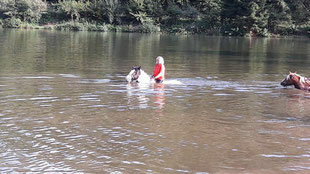 The horses enjoyed the break too! 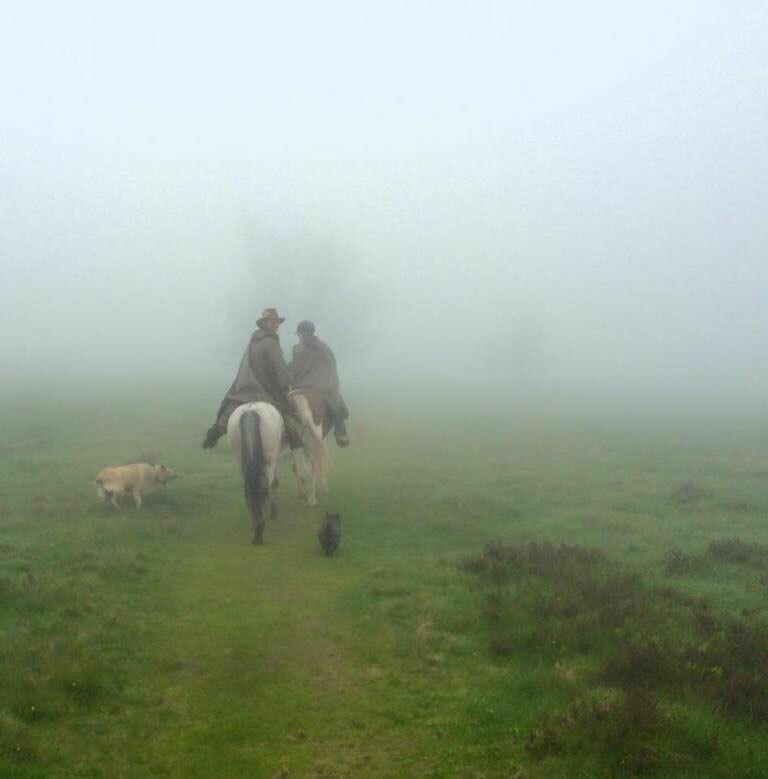 Sometimes the funniest things happen when we're out with the horses. A few days ago we stopped off at Soultzerkopf for a little break and a guy asked me if a "little boy" could sit on Elmo.... Of course I said yes. It turned out that the "little boy" was wearing next to nothing and was celebrating his bachelor party! We all had a really good laugh! The weather here in Alsace is getting better and better. The forest is really starting to wake up again after hibernating all winter. I was out with my husband and son on Good Friday for a family ride, and now the temperatures are up to around 20°C with glorious blue skies. The horses are loving it too because there are still very few flies buzzing around to bother them. I'm really looking forward to riding (or driving) with my guests in the next few weeks. I've done it! 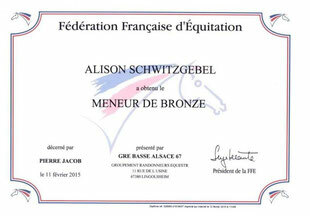 I finally have my French qualification as a carriage-driven trail guide. 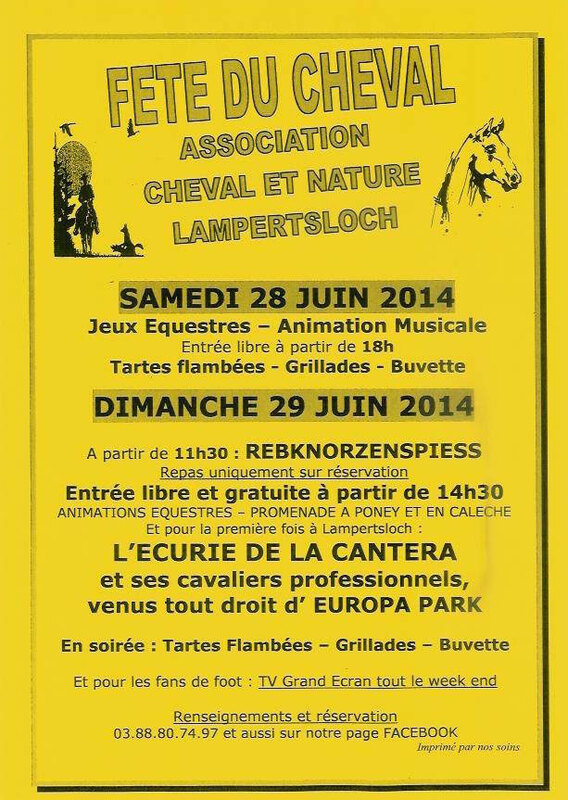 Thanks to Pierre and Sylvie Jacob from the "Domaine Equestre de Stambach" close to Saverne. 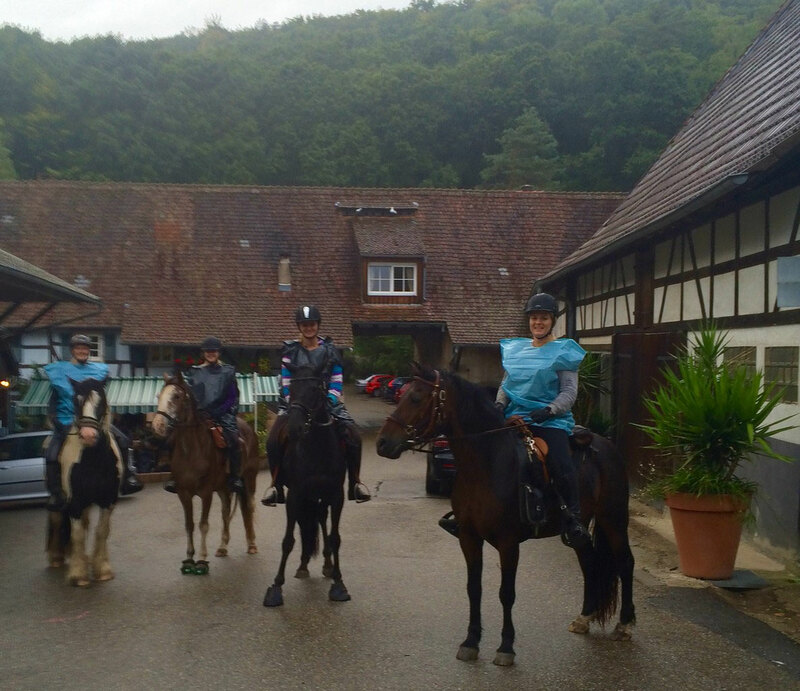 The lessons were very relaxed and the atmosphere at the stables was great. I'm really looking forward to driving back to Stambach on our carriage-driven trail in the middle of May. 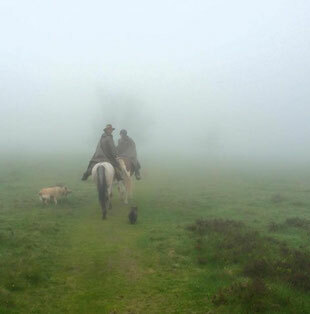 We were out for the first time with all of the horses on Saturday. After an excellent hoof workshop in the morning - where we learned everything about horses hooves, from their structure, care, diseases and protection through to how to replace a lost horseshoe - we enjoyed a delicious lunch in a cosy restaurant before heading off for a few hours of riding in the forest. We all learned a lot - and it was lovely to spend such a wonderful day with such nice people. We were working in the forest again last week with Elmo, our heavy horse. 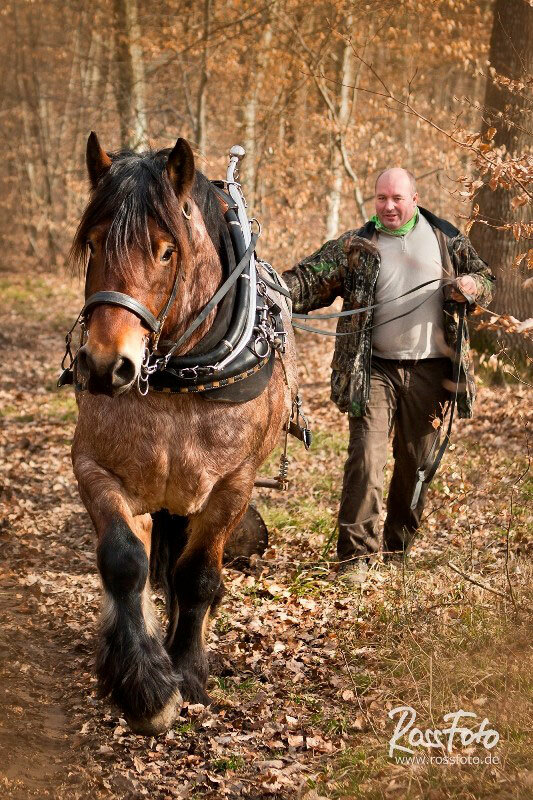 It's quite impressive when a horse pulls a log weighing a couple of hundred kilos through the forest and makes it look totally easy! 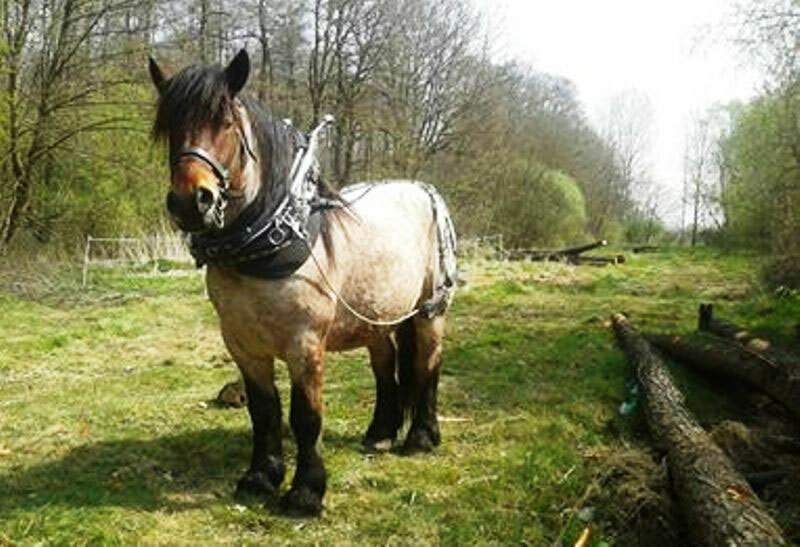 Logging with horses is really hard work, for the horse and for the loggers, but it is far better for the environment and the delicate forest floor than working with a tractor. And it is Elmo's absolute favourite kind of work! Long may it contine. What a wonderful weekend. Two days in the saddle with great weather, great people. 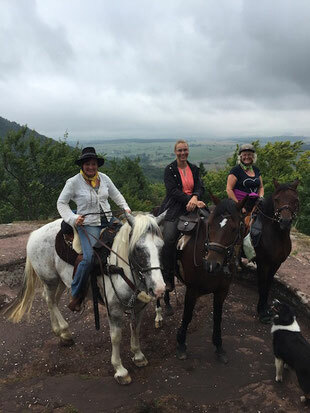 We rode to the blessing of horses just over the border in the German village of Hirschthal, guarded over by the ruins of Fleckenstein Castle. Thanks to the organizers for a superb aftenoon. 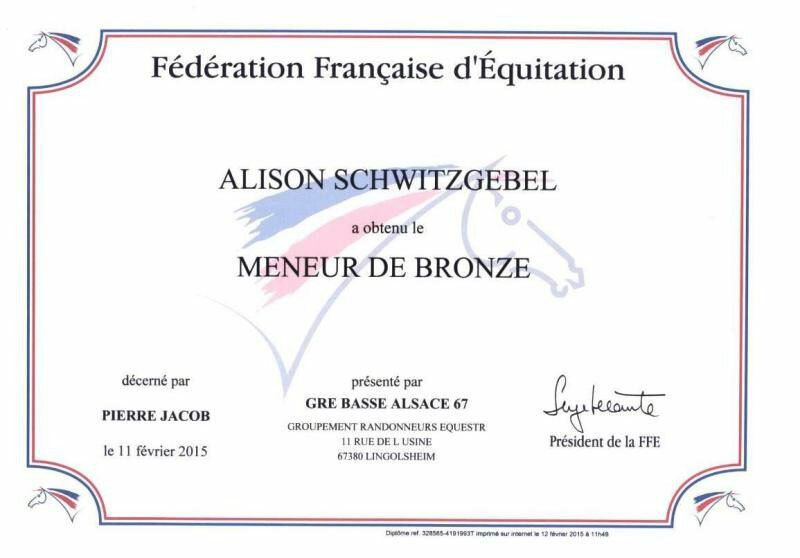 There's generally not too much going on in trail riding centers in the winter, so I've been putting my time to good use to get some French qualifications. 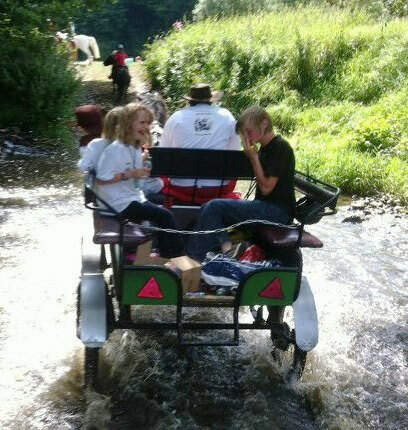 Yesterday I passed the first stage and got my carriage driving license. 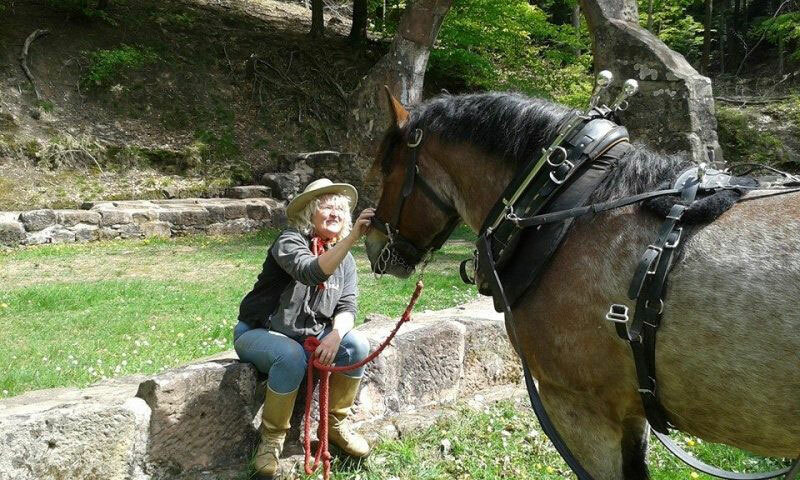 The next stage is to get my diploma as a carriage driving guide - and now the only thing between me and that qualification is my first aid certificate. It would be so much easier if qualifications were recognised internationally! How time flies! 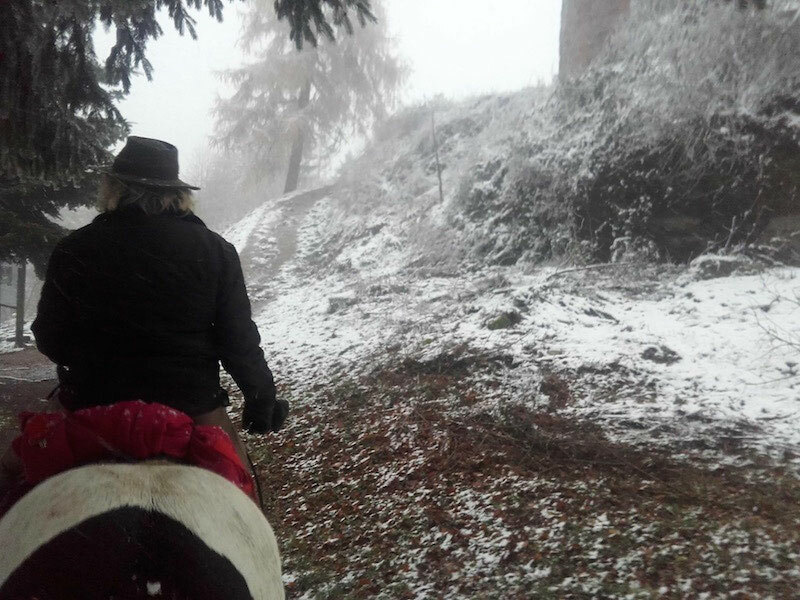 Winter has finally arrived and Northern Alsace is covered with snow. This weekend I had an afternoon out with the family (and the horses of course!). Because I know my kids I made a campfire to warm my hands while I was waiting for the kids. The snow is supposed to stay with us until at least the middle of February, so if you fancy a ride through the snowy countryside, then just give me a call! What an amazing time we had! 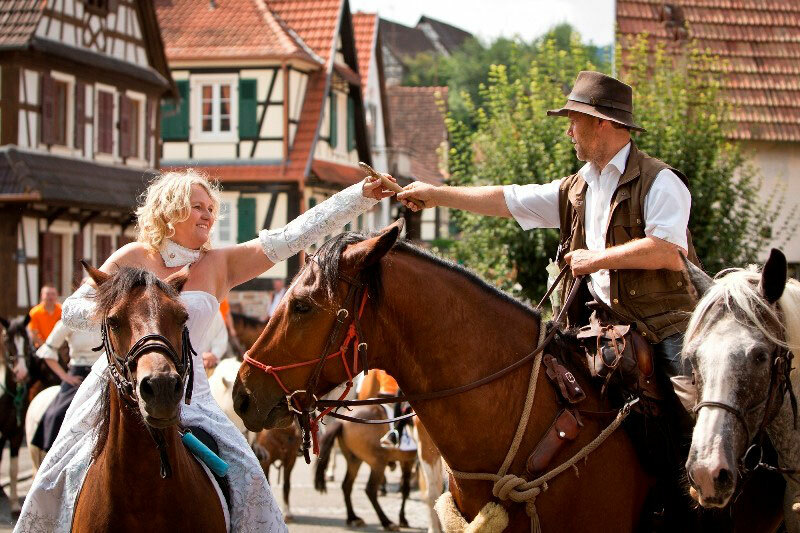 We not only celebrated an amazing wedding with a ridden procession with more than 30 riders, and Hansjörg Ruof handed me the baton for the DWA relay ride in the heart of Lampertsloch. 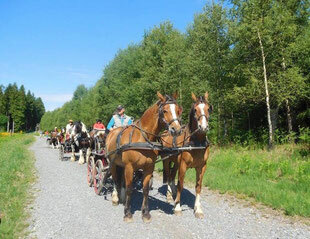 My group of ten riders left Lampertsloch on 14 July, the French national holiday, to take the baton to Obersteinbach and hand it over personally to Herbert Fischer. What a superb group of riders you were - it was really fun riding with you, and I look forward to seeing you all again. The DWA Relay Ride 2014 has started. 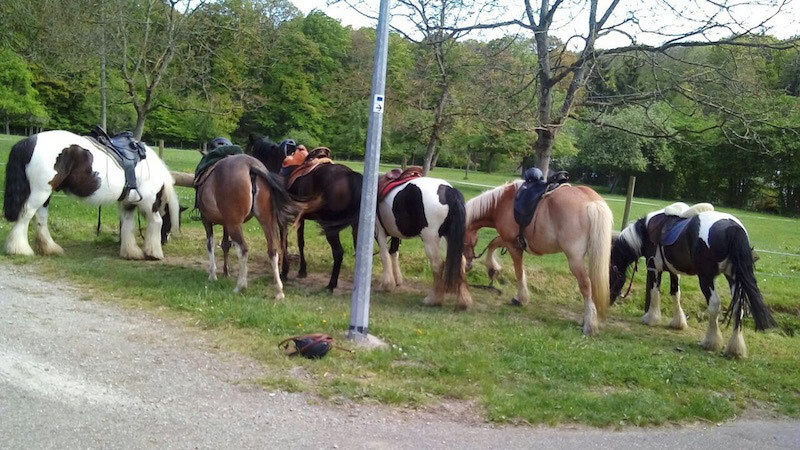 The first group, led by Walter Herensperger from the Engadin River Ranch started in St. Moritz on 28 May with a total of 13 riders and horses. The first group's part of the relay ride is already over, and they handed over the relay baton to Men Juon from the San Jon stables on 1 June. We're really looking forward to welcoming the riders here in Alsace on 12 July, and after a day's rest my riders will take the relay baton to Obersteinbach on 14 July to hand it over to Herbert Fischer personally. That's going to be such a wonderful ride! Yes, I've done it! 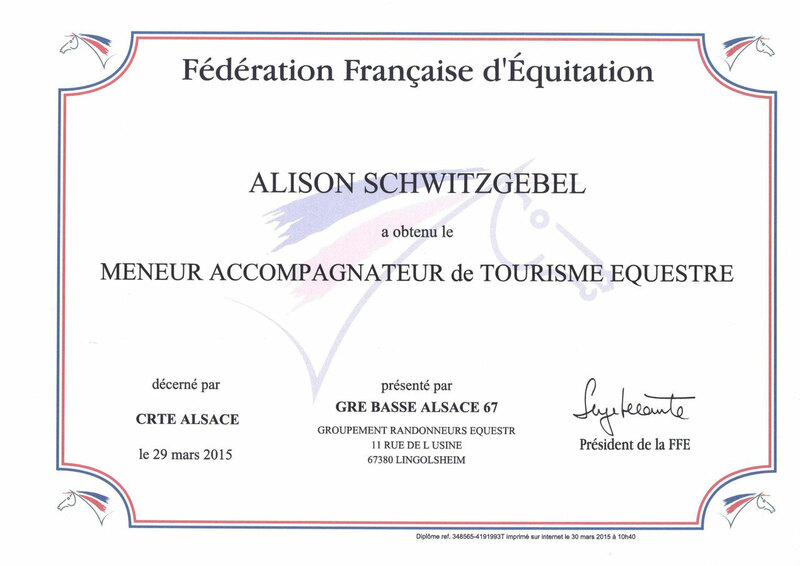 After two wonderful days in the saddle with Herbert Fischer and his riding guests, I not only got to know his horses from the Fischerhof, I also passed my exam as a qualified trail riding guide "Geländerittführer DWA". Thanks to all of you for the wonderful time we spent together, and also to Christine and Christof for the excellent picknicks. Now I need to frame my certificate and hang it up on the wall. 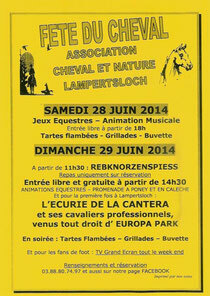 Every year on the last weekend in June, the riding club here in Lampertsloch celebrates a "Festival of Horses". 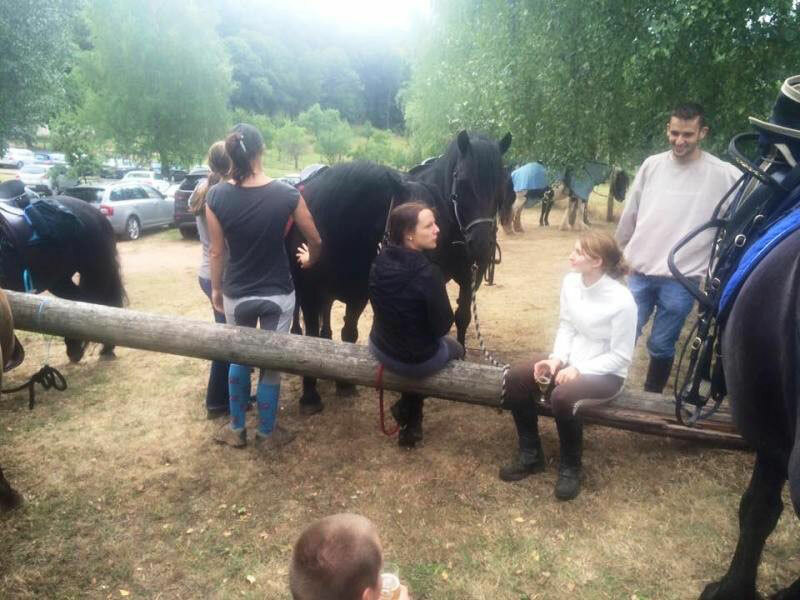 On Saturday there is a small gymkhana, and music and "tartes flambées" in the evening, and on Sunday there is a presentation by a group of equestrian artistes and delicious "Rebknorzenspiess" (marinated porc grilled over old vine wood). Tickets for the meal on Sunday have to be bought in advance. It's going to be an excellent weekend. Back home again after three unforgettable weeks - we escaped to Le Hohwald and enjoyed some spectacular trails, then a terrific tour with some terrific carriage drivers, followed by a week with the "3 Bs". I had a wonderful time with all of you - I can't wait to do it all again! Preparations for the DWA Relay Ride are really hotting up. 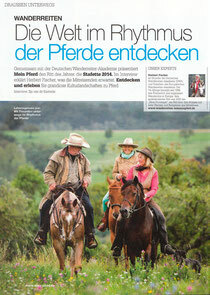 The German equestrian magazine Mein Pferd interviewed Herbert Fischer to find out what the riders can expect during the ride. 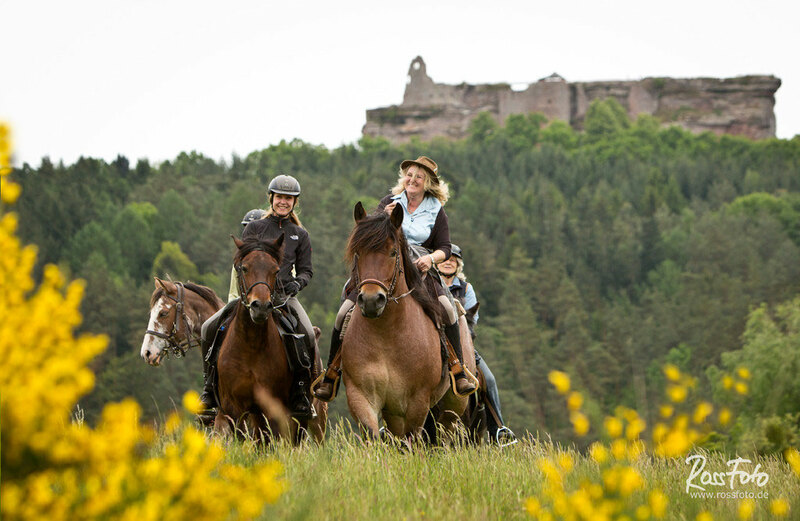 During my section of the ride I can promise you: the wonderful countryside of the North Vosges, a panorama-picknick, an unforgettable stay at Hotel Anthon in Obersteinbach (an equestrian stop over point par excellence), and last but not least the red sandstone ruins of a whole series of castles. And it will all be totally in the rhythm of the horses. I would like to offer special thanks to Dana Krimmling, who took the wonderful pictures. You can find the whole interview in my "Gallery". 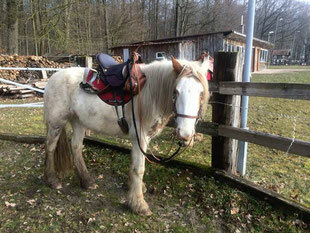 ... and if we're not in the saddle.... Elmo is working this week in the forest of Forstfeld, here in the Alsace. There are around 250 heavy logs there that have to be taken out of the forest. We're using the so-called combined logging method. The delicate forest floor means that we can't enter the forest with the tractor, which means that it always has to stay outside the forest. So Elmo pulls the winch into the forest, and then he pulls the logs over to the winch hook, which we then use to pull the logs out of the forest. That means that Elmo has some breaks during his work - and it is heavy work! But we are enjoying ourselves - and Elmo is too. We're ready - the bags are packed, I've put some terrific pictures on the Laptop (thanks Dana), and I'm about to get in the car and head off to the trade fair in Friedrichshafen. 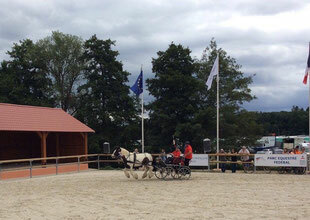 Pferd Bodensee 2014: an international trade fair for specialists and the general public, with around 300 exhibitors from Germany and abroad. I'm already looking forward to seeing some old friends and meeting some new ones :-) You can find us in Hall A4, Stand F15. The riders from Germany's Wasgau region want to start the New Year with God's blessing. 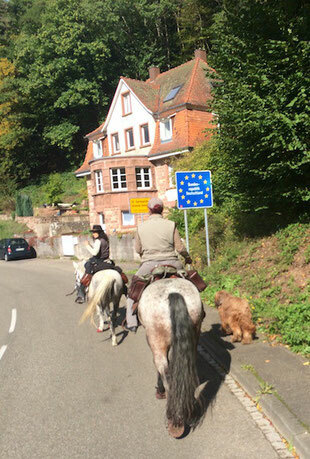 That is why the village of Hirschthal on the French/German border is holding an ecumenical, international blessing of horses. Of course Alice is also going to be there. 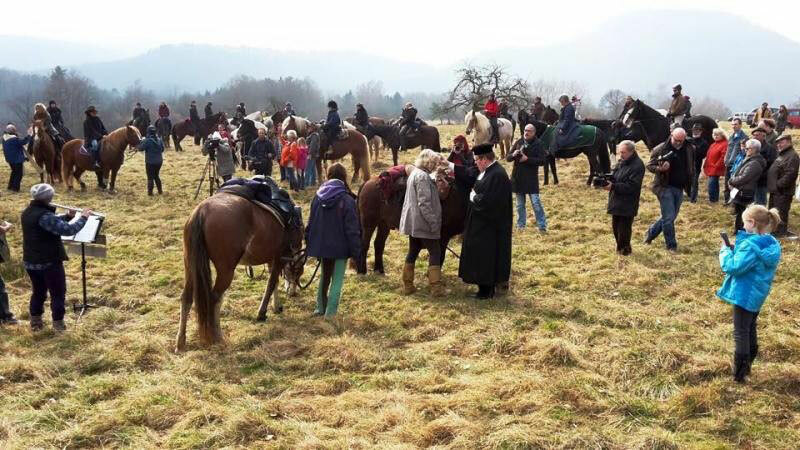 High on the fields above Hirschthal, with a wonderful view of Château Fleckenstein, a priest and a minister will bless around 40 horses on January 25. After a mulled wine in front of the glowing fire, the horses and riders will ride around the sandstone ruins together. Kai Fichter, one of the event organizers, commented: "All riders, and all horses are welcome to take part. It is time to honor our four-legged friends and to thank them for their company." 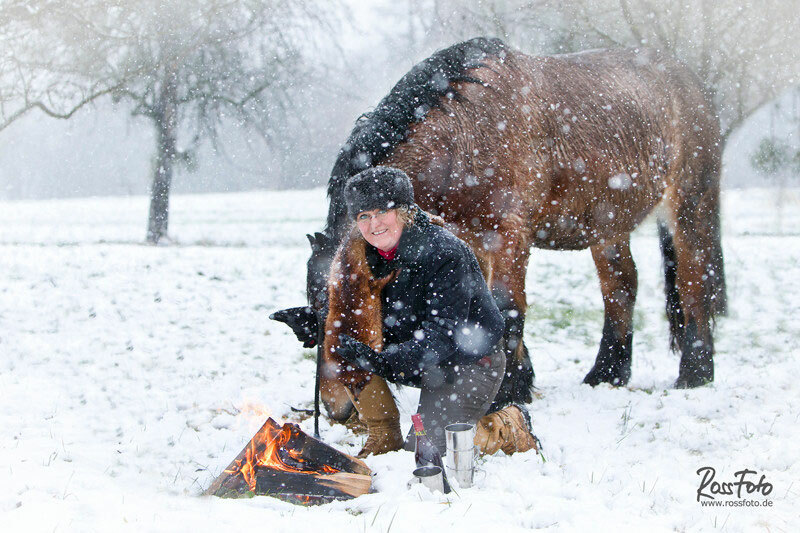 The New Year is already here, the horses are in their winter stable, and we're using the long winter evenings to add new highlights to our plans for 2014. 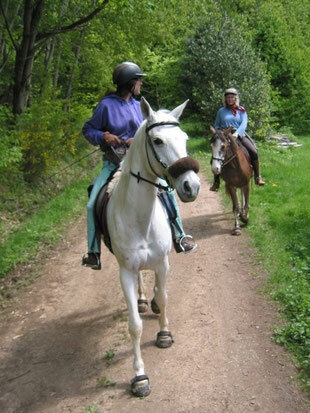 We already have several wonderful trails ont he program, including the DWA Relay Ride. The baton, which wil make its way from St. Moritz in Switzerland over the Alps, past Lake Constance, and through the Black Forest, will be handed over at our wedding on July 12. A very special, albeit temporary wedding present from Hansjörg Ruof, DWA Trail Guide from Wanderreiten im Heckengau and his team of riders. It's going to be quite a party! 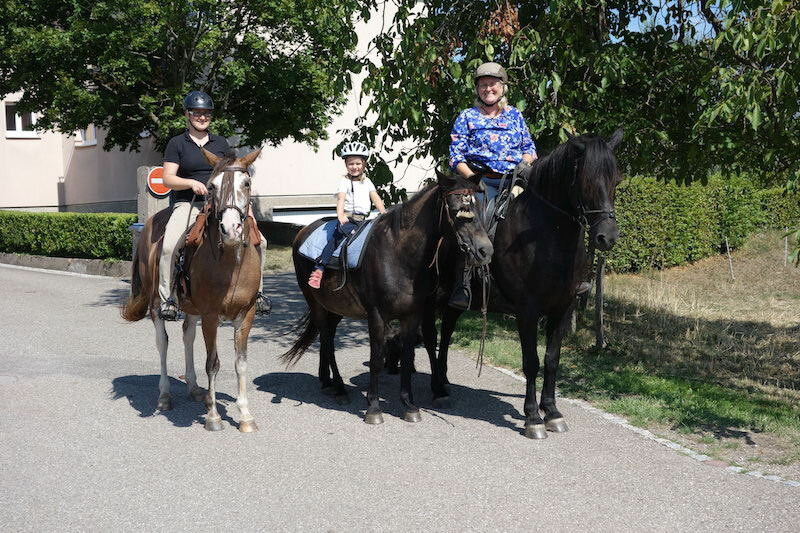 After a rest day, the relay ride will continue on July 14, Bastille Day, to Obersteinbach, where we will hand the baton over to Herbert Fischer, the founder of the DWA and his team of riders. We're looking forward to it already. Christmas is coming! 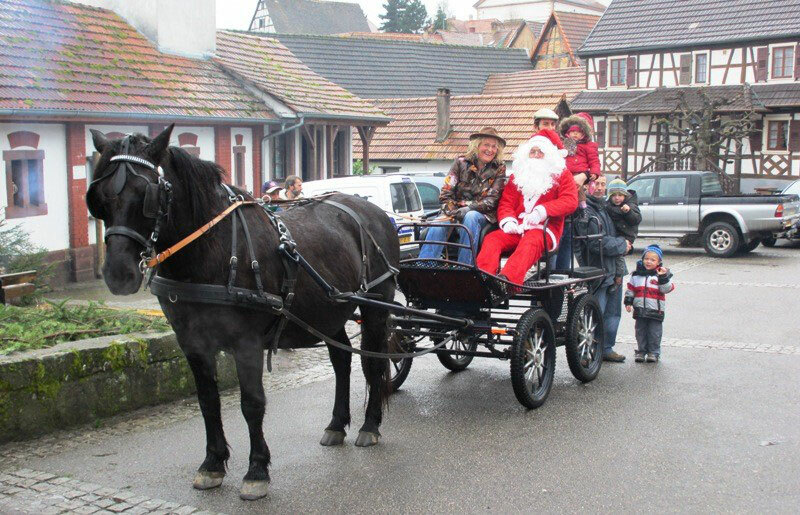 Every year on the last Sunday before Christmas Santa Claus visits the village of Lampertsloch. The event is organised by the village riding club ACN, with mulled wine and "Bredele" (Chistmas cookies) for the grown-ups, and sweeties for the children. What could be nicer than taking a spin round the village with Santa Claus and a horse and cart. 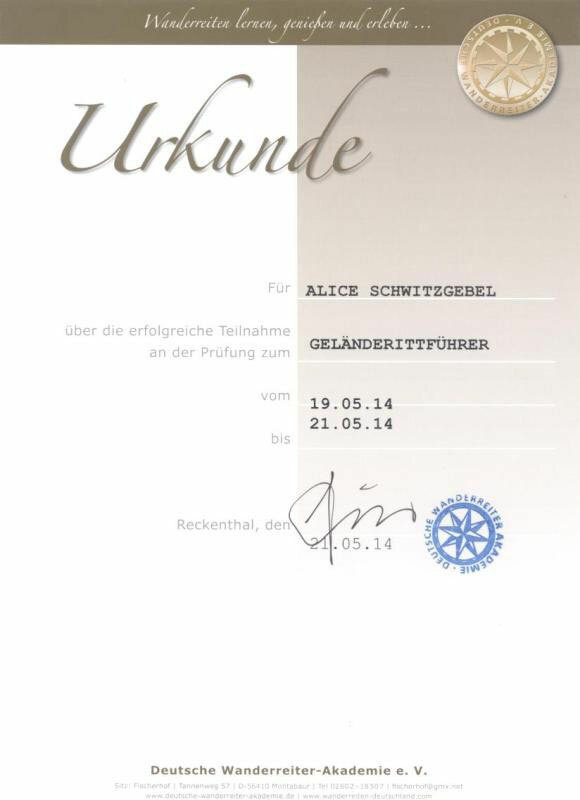 Alice en selle joined the Deutsche Wanderreiter Akademie last month. 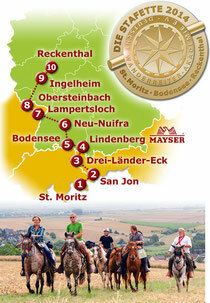 DWA is a federation of trail riding centers throughout Europe, headed by the master trail rider Herbert Fischer. 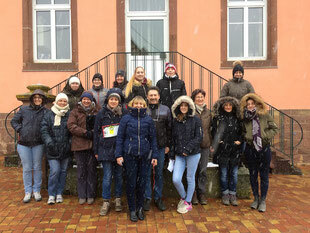 Last weekend we met at the Fischerhof in Reckenthal in the heart of Germany for the annual meeting of colleagues - a wonderful event with friends and colleagues from Germany, France, Switzerland, Hungary, Romania and Italy. The DWA organises a relay ride, the so-called "Stafette" once per year. 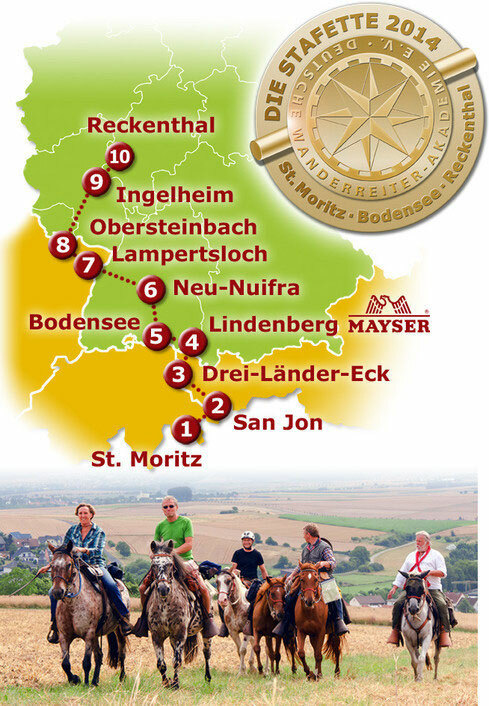 In 2014 the ride will be starting in St. Moritz (Switzerland), will cross the Alps, to Lake Constance, the Black Forest, Alscace, the Palatinate Forest, the Middle Rhine Valley and the Taunus region, culminating in the Westerwald for the "Fest der Windrose", a marvellous trail riding event taking being held at the Fischerhof. I have the honor of organising the relay through the North Vosges, and will be handing over the relay baton in Wissembourg. I'm really looking forward to the preparations and the ride itself, and will keep you posted right here! Now I've got something else to look forward to. A couple of really nice people who came on one of my rides this year have asked if they can come again next year, but with their carriage. Of course they can! After being in the saddle, my favorite place in the world is probably driving my carriage. So the first "Alsace en caleche" trail for drivers with their own carts is in planning. I'm really looking forward to it. 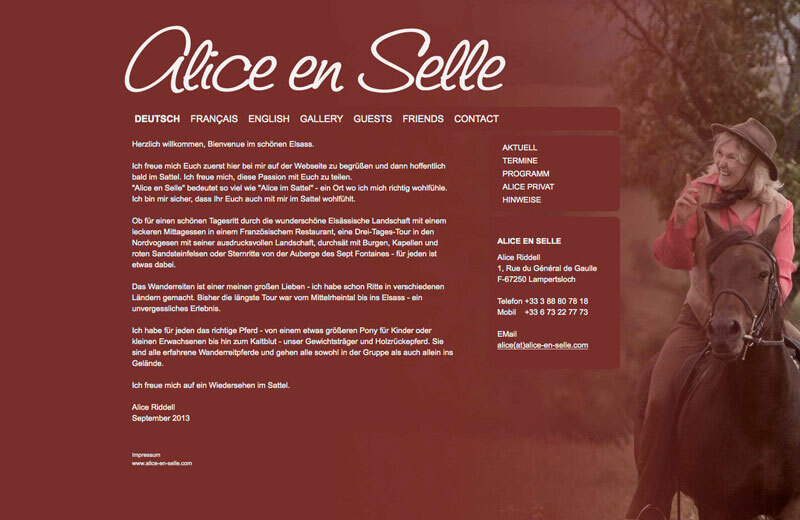 Alice en selle, in the middle of an Alsatian orchard. 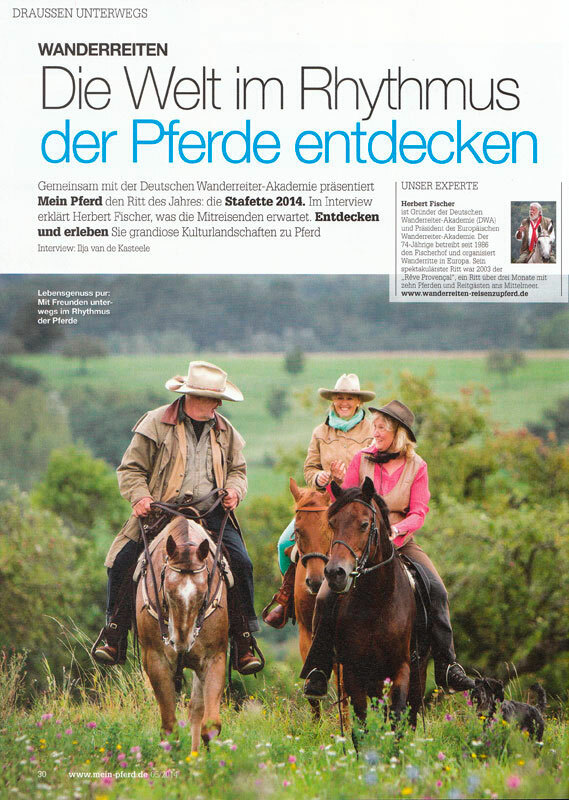 A terrific autumnal photo from Dana's RossFoto camera is now the crowing glory of the German online trail riding magazine Wanderreitermagazin, created by Heike and Martin Gruber. ... if you speak German it's an excellent site to browse through on long winter evenings! YES :-) Today I got confirmation from the responsible forestry commission that we can ride through the Foret du Katzenthal on Thursday. A private forest with wonderful trails and the remains of a village that used to belong to Chateau Fleckenstein. The farrier was there today - now all my horses have great-looking feet! Now everything is ready for the Randonée Alsacienne next week. 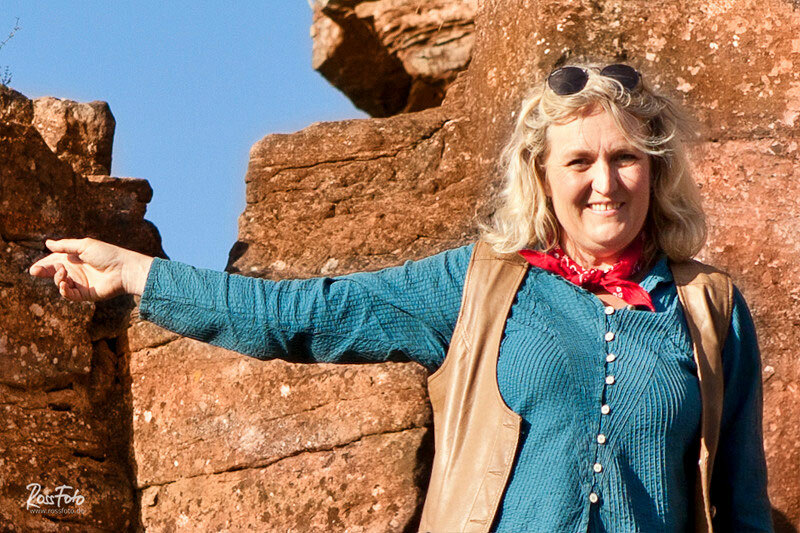 I'm really looking forward to heading off in the saddle with some wonderful riders. Alice en selle - after spending hours and hours slaving away, the Web site is online, flyers and business cards are being printed as I write. We're working really hard at getting Alice en selle up and running. The trails were planned long ago, and now we've put the final touches to the organisational side of things and the accommodation is all sourted out. A huge "merci" to Philippe Finck from the Ferme Auberge du Moulin des 7 Fontaines for making magic possible. We're really looking forward to spending some wonderful evenings and nights in your romantic half-timbered mill. The big decision has been taken: as an experienced trail rider and trail leader, I'm going to open my very own trail riding operation. Ta-daaaaaa! Keep tuned in and I'll keep you posted.